Why can’t anyone quite put their finger on what makes this Los Angeles band so special? We can only sit and wonder at the unknowable set of circumstances that keep the universe in check. The chains of ecosystems that teeter on the brink; the gentle precarities of hot and cold that keep infinitesimal things alive; the matter of seconds or days or yes/no choices that cause history to tick and that set us down exactly where we are, rather than where we might have been. While the domestic equivalents of this astronomic balancing act might not be a matter of life or death, there’s still something miraculous in the incidental meeting of minds and the unexpected upshot of a life meandering through places and around people, only to find itself in exactly the right spot. 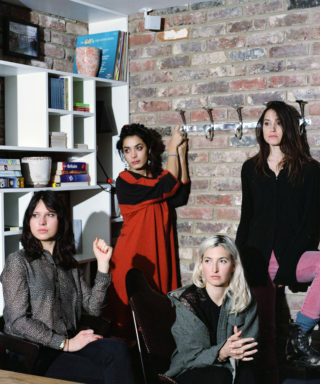 To spend any length of the time in the orbit of Emily Kokal, Theresa Wayman, Jenny Lee-Lindberg and Stella Mozgawa – the four-headed Siren being that is Warpaint – is to witness exactly this kind of joyful equilibrium; a coterie of totally shared understandings and creative intent born out of childhood friendships and deeply forged new ones that happen to fit perfectly. 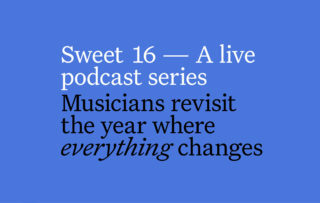 Kokal and Wayman met at school in Oregon, Lindberg hails from Nevada and Mozgawa from New Zealand, all four of them having drifted separately to LA, a hazy dream-world of possibility in the shape of boys, the amorphous entertainment industry and potential encounters with kindred spirits. 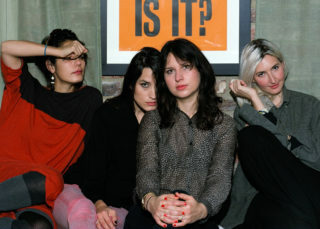 Seven years later Warpaint have done the impossible; outliving the idle chatter of their well-worn origin tale – complete with A-list cameos – and making the real story about the rare and curious product of their serendipitous union; an enduring music that feels like it’s always existed – like it was somehow always meant to be. 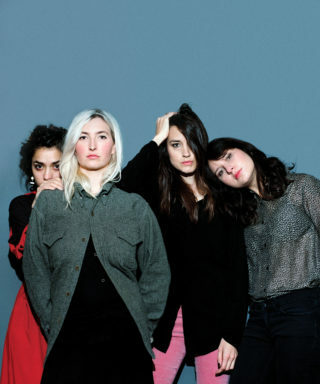 With such blatant aversions festering in their individual pasts, it’s incredible that Warpaint find themselves now three years into a definitive line up, a blistering debut album under their belts and – off the back of two years intense touring – another just about to surface. The eponymously titled follow up to 2010’s rapturously received ‘The Fool’ shows no signs of having emerged from a place of fear or doubt; whatever was sparked on the first album has been concentrated, bottled and coolly sprinkled over music that could not really have been made by anyone else. 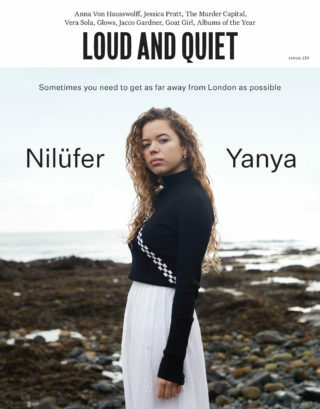 Rather than exhausting them, the relentless tour of those early songs has been galvanising and – with the driving presence of Mozgawa, the last, blistering piece of the puzzle – they’ve cleaned the slate, broken free of familiar patterns and let loose on exploring the wily limits of an even more personal sound. 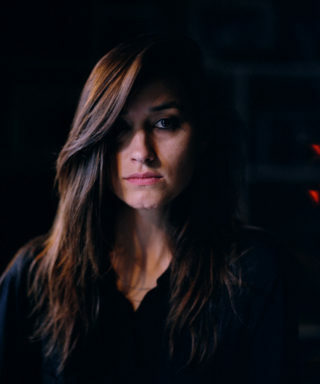 Quite a mountain to scale in the relatively short space of time since Warpaint first started turning heads: “Yeah, we definitely weren’t taking our time and just sitting around,” says Kokal, marvelling at three years vanishing in the blink of an eye. When we meet they’re a day away from heading home after three months weaving new material into their live set and reliving the process of the new record’s genesis in a string of press interviews. Unsurprisingly they’re flagging a little; occasionally drifting off mid-sentence, fighting to keep awake when the photographer plunges the room into atmospheric darkness for our cover shot and occasionally losing the plot entirely – “wow, I think that was it!” Mozawa gulps, wiping away tears of hysterical laughter and crumbling into incoherency apparently over nothing. Warpaint’s shared desire for experimentation and the free flowing of individual ideas is the subject on which they’re all most effusive, as if the harmony they’ve clicked into is the perpetual bass note, the only element of their creative process that’s not up for discussion. 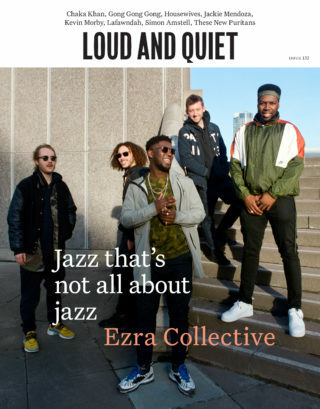 It’s a mark of maturity, too, and an explanation of the most striking thing about their sound; its unmistakable depth, the unhurried product of something that took its time and is in no doubt about what it is. Clearly there’s something about the listening experience that involves shifting register and inhabiting the band’s particular wavelength. 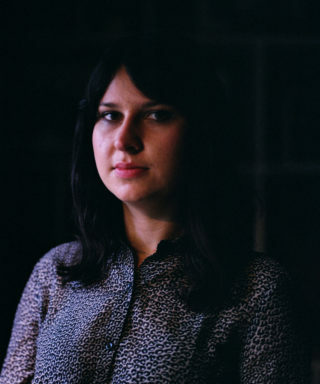 Like ‘The Fool’, ‘Warpaint’ repays a patient and attentive ear – time passes, the music creeps under your skin and suddenly, out of an amorphous, disorienting whole, those succinct melodies gradually begin to emerge. 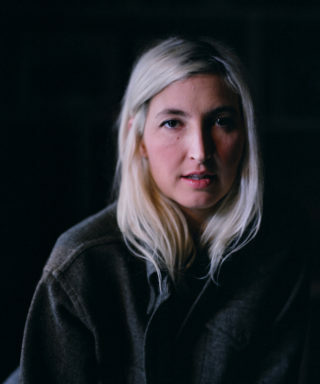 The first single swims around the bittersweet, rhythmic mantra “Love is to die / Love is to not die / Love is to dance”; ‘Hi’ broods over crisp electronic beats; ‘Go In’, penned by Mozgawa, is a louche masterpiece of understatement and ‘CC’, driven by Lindberg, might be the grungiest thing they’ll ever produce. 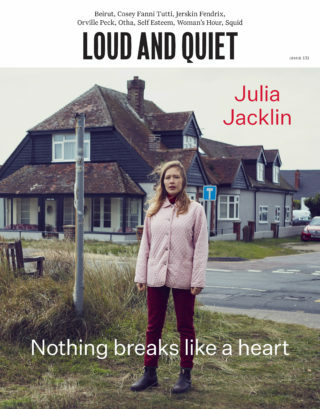 The more you delve into the record, the more their specific personalities are revealed, but the thing that tethers it together is the particular blend of timbres that somehow make one, stunning vocal entity; a soft, communal roar that is unmistakably theirs. Perhaps the most logical way to translate this atmosphere of closeness that Warpaint both generate and seem to crave creatively is into the notion of a family. 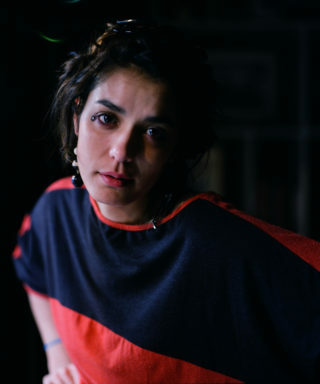 And it’s a motley extended one that includes Wayman’s son, her long distance partner James Blake, and Lindberg’s husband – the maverick, Reading born, video director Chris Cunningham – who plays a direct part in bringing the band’s vision for ‘Warpaint’ to life. The band had begun filming one another during the Joshua Tree sessions, just to document their time and “have something in 40 years, y’know,” as Lindberg puts it. But Cunningham was on site too, working on his own projects and taking his place at the family table before eventually beginning to gather footage of the band himself. The result is Love is to Die, a full length film that will accompany the album when it’s released early next year, but don’t expect a fly on the wall documentary – teaser clips suggest that the potent atmosphere of their creative coven has been distilled, layered and set against an underscore of howling desert winds that are tinged with the ghost-girl harmonies. “His soundtrack is probably going to sell more albums than ours!” jokes Kokal. 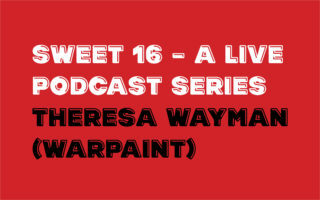 While they’re clearly focused on driving more of themselves into their music, even opening their private, collective world to a bigger audience in the shape of a film, what makes Warpaint such an alluring prospect is the sense that you can never quite pin them down. Between the music that takes its time, a maturity that defies flighty commercialism and the secret alchemy of their friendship bond, the mercurial nature of the band slides in and out of tangibility; even Cunningham’s album artwork alludes to this – depicting four spectral personalities merging into one chimeric whole. They’re both the strange girls on the peripheries of the schoolyard and a classic girl gang that you’d sell your soul to join. They’re goofballs too, cracking each other up as often as they slip into contemplation; just like the track listing of the new record which flits from the gentle, harmonic tug of ‘Teese’ into ‘Disco/Very’ – the Warpaint-ian notion of a floor filler being a snarling, Slits-y, comic book anthem that carries the warning “Don’t you battle / We’ll kill you / Rip you up and tear you in two”. So what’s next for them? While the world casts judgement on the sonic twists and turns of the new album, what will Warpaint do with their renewed sense of balance and possibility? Despite the particularity of their identity as a collective, Mozgawa, Lindberg, Wayman and Kokal are clearly never going to be interested in JUST being instrumentalists and will doubtlessly want to explore projects beyond the limits of the band.